Final food: The final snacks are in irregular twist shape . Twist snacks are very crunchy and great in taste. They are made by a special extrusion process. The corn grains are moisturized in the flour mixer with water and fed to the Rotary Head Extruder. 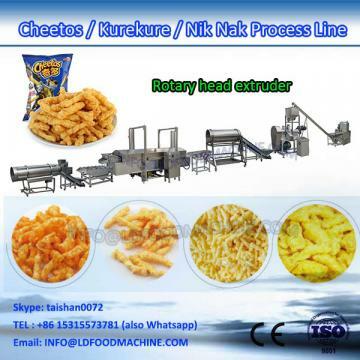 In the extruder, they are squeezed and twisted to form curls shape. The twist snacks are fried in cooking oil or toasted in oven and then cooled before flavoring. Seasoning is sprayed on the surface to improve their taste. 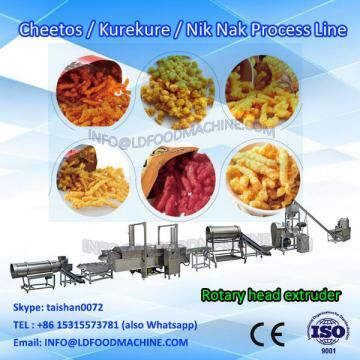 Our rotary head food extruder is very suitable for making Kurkure, Cheetos and Niknak. And it is well received by our customers in a wide range of countries, including Malaysia,Indonesia, Pakistan, and so on. We make the all parts in our own workshop except for the main electric parts that can keep the quality and technology always to be good. and ready for the after-sale installation service. 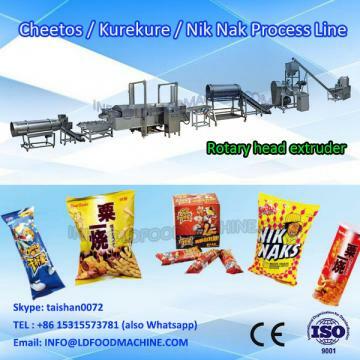 Jinan Eagle Food Machinery Co., Ltd. is the leading manufacturer of Extrusion food machinery in China. 3D compounded crisp, nutritional rice , bread crumb , cheetos, Doritos and so on.